Of all the native trees of Ireland, hawthorn, elder, and rowan are perhaps the most storied, literally — all three trees, and especially hawthorn, have featured in our folklore and legend for centuries, and each is so important that it is associated with a letter of the Ogham alphabet. They all have a wealth of practical and medicinal uses, and they are all vastly important to the ecology of our countryside. It should be no surprise that all three trees also are strongly associated with the world of faerie. Although each tree is very different in most characteristics, they each greet the hope of a new spring with a spray of white flowers, and they each bear small berries at harvest time. The profusion of white flowers, especially, erupting in time for Beltaine, were seen as a sign that the trees were favoured by the faerie. Because of this, the trees gained status as trees of protection — against evil, witches, charm, bad luck, ill health, poverty, poor harvest, practically anything. The trees themselves also gained a measure of protection. It was considered lucky to have one of these trees growing near one’s house (traditionally, a rowan at the front and an elder at the back), but ill fortune would befall anyone harming any of these trees without asking permission and offering something in return to the faerie. Fallen branches could be gathered, but our ancestors would never have taken live wood from the growing tree itself. A lone hawthorn was believed to be a trysting place of the faerie or the home of a faerie, and anyone harming such a tree would become the focus of their often deadly wrath. In fact, to this day it is possible to see roads diverted around hawthorn trees that labourers refused to cut down! As the Church gained influence, they saw this respect for plants and spirits as pagan idolatry, and spread the story that the trees were evil, using this association with the faerie to likewise weaken the regard for the fae folk. It was said that the cross of Jesus was made of elder and that Judas hung himself from an elder tree, and therefore this tree especially was cursed in the eyes of God. Ironically, this furthered the protection of the trees, as people still avoided cutting them down, though for a different reason. The Church may have considered such strong approbation of the elder to be necessary because the tree was especially revered for its mystical and medicinal powers. Elder, which gave its name to the ogham letter R, ruis, is a symbol of regeneration and rebirth. It is the tree of Samhain, the end of the agricultural year and the beginning of the new. Elder puts out shoots at its base, rejuvenating itself, and grows easily from cuttings. This made it a powerful symbol of the cycle of life, death, and rebirth for our ancestors, and elder is often found in graveyards, where it was planted and crosses made of its wood were placed on new graves to help the spirits cross over. Sitting under an elder at midsummer was said to allow one to see the faerie on their way to their great feast — but beware falling asleep, or they might transport you to their timeless realm, from whence there is no escape! Although its wood is soft and burns poorly, elder has possibly the largest range of medicinal and culinary uses of any known plant, going all the way back to the ancient Greeks and Romans. Every part of the tree has medicinal use — the leaves, buds, flowers, berries, root, pith, bark, and even a fungus that grows on the bark. (Care must be taken, because the leaves can be toxic and the bark is a strong purgative.) It’s no wonder that our ancestors, and people all across northern Europe, thought the elder a magical tree! These days, of course, the berries and flowers are best known. The dark purple berries are an abundant source of vitamin C. Folk medicine uses elderberries to fight flu, coughs, and colds, and as a blood tonic to relieve gout, rheumatism and nerve pains. Modern research has found that a compound in elderberries surrounds the flu virus and stops it invading our cells, corroborating their use as a flu remedy. Elderflowers have even more uses — far too many to list here. Elderflowers and berries also make delicious jams, puddings, and sauces, and there are even recipes for elderflower fritters. And, of course, there is elderberry wine and elderflower wine, cordial, and champagne. . . .
Rowan, representing the ogham letter L, luis, looks very similar to elder; the most obvious difference is its bright red berries, as opposed to elder’s dark purple. However, despite their similarity, the trees are not related —surprisingly, rowan is a member of the rose family. It is widespread throughout Europe and is commonly known as ‘the druid’s tree’. Rowan is also called mountain ash (although it is not an ash) because it grows well at high altitude and in poor, rocky soil, making it especially important in harsher parts of the ecosystem. Like elder, rowan is also a tree of protection, against the devil (and evil in general), charms, and the dead. 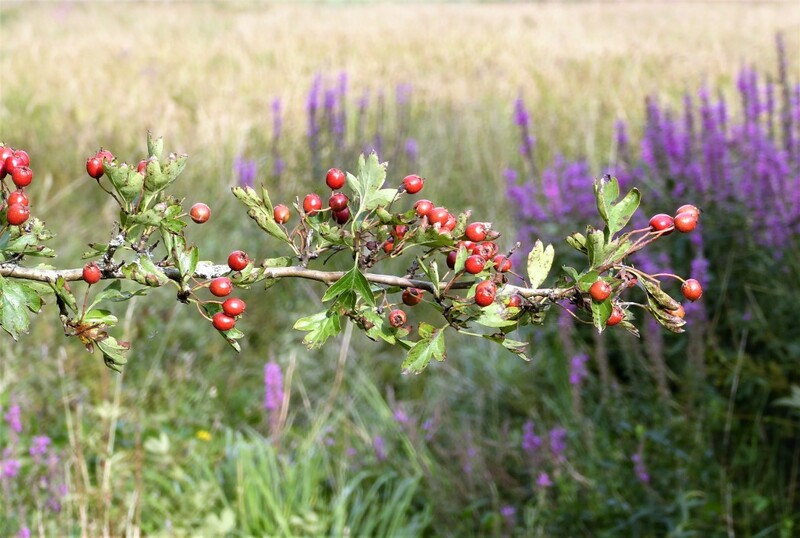 Hawthorn, the ogham letter H, huathe, is named for its bright red haws (berries) and its formidable thorns, which are several centimetres long. In fact, the thorns are so indicative of this tree that it is often simply called thorn — and as such is the most common tree found in place names in England, and was the tree most frequently mentioned in Anglo-Saxon boundary charters. The small oak-like leaves of the hawthorn are edible, and the blossoms and berries are made into wines and jellies, and decoctions of the flowers and leaves were used to stabilise blood pressure. The strong, close-grained wood was used for carving, and for making tool handles and other small household items. But as important as these trees are to humans, they are far more important to the broader ecosystem. The flowers of all three trees provide nectar for a variety of insects, including many moth caterpillars; hawthorn alone supports more than 300 species of insect. The flowers also are an important source of pollen and nectar for bees and other pollinating insects. Birds and small mammals such as voles and dormice eat both the flowers and the berries, and deer often graze rowan leaves. Elder is a keystone species in many ecosystems. Some Native American peoples consider elder to be a mother of the forest, believing that it teaches other plants how to grow and what to do. Rowan is an important understorey tree in upland oakwood, mixed ashwood, and native pine woodland, which are priority habitats under the UK Biodiversity Action Plan and are also especially vital in re-establishing native woodland habitat in Ireland, which has lost so much of its forests over the centuries. Hawthorn berries are rich in antioxidants and are eaten by many birds during their migrations, including redwings, fieldfares and thrushes. 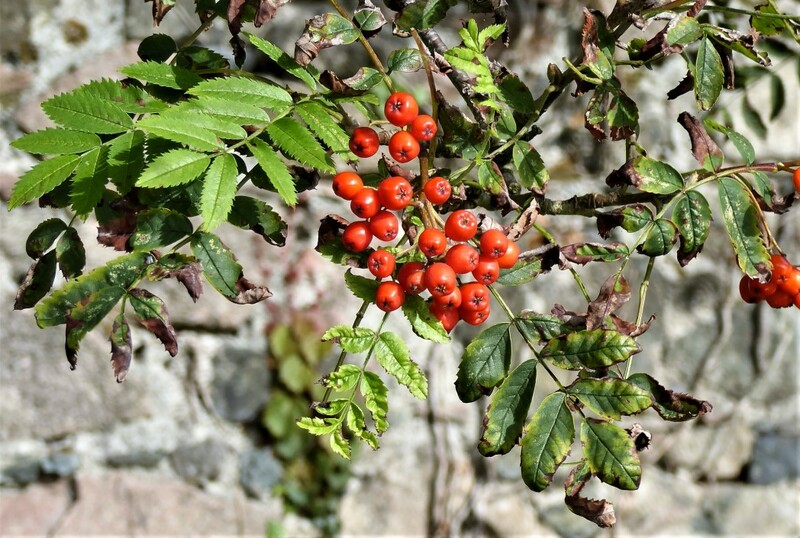 Rowan berries are favoured by the blackbird, mistle thrush, redstart, redwing, song thrush, fieldfare and waxwing; mistle thrushes defend rowans trees as their territory, not for nesting, but because the berries provide food throughout the winter. The dense thorny foliage makes fantastic nesting shelter for many species of bird. Hawthorn, elder, and rowan are all small trees, rarely taller than 15 metres, and very slender, so they have little use as building timber; as the vast forests of native oak were cleared over the centuries, these smaller trees remained, and now are some of the most common native trees in Ireland these days. Hardy rowan, with its silvery bark, lush green filigree of leaves, and bright red berries, is a popular ornamental tree along streets, where it can tolerate cramped plantings, poor maintenance, and pollution. Elder and especially hawthorn have been common hedgerow trees for centuries. Originally, hedgerows were planted to mark out different fields and townlands as the native forests that once covered 80% of Ireland were cleared. Hawthorn, also commonly known as whitethorn — along with its ‘evil’ opposite, blackthorn (whose sour sloes are used in jam and to make sloe gin) — are the most common hedgerow plants because they grow quickly into thick bushes, tangled and thorny enough to keep even cattle from straying. As hedgerows proliferated, a huge number of animals and plants adapted themselves to make use of this special habitat, especially as forest habitats dwindled. Today, hedgerows are one of the most important habitats in Ireland, providing nesting sites, food, and protection to hundreds of species of mammals, birds, and insects. Sadly, from the 1960s to the 1980s, almost 20% of hedgerows were dug up and replaced with barbed wire and electric fences to free up extra land for agriculture and to make way for larger farm machinery. Even worse, pressure from farmers has lately seen a weakening of laws restricting the trimming of hedgerows during nesting season. The very ill-considered 2018 Heritage Bill will, beginning in 2019, allow “burning of vegetation” through March and “the cutting of vegetation growing in any hedge or ditch on the roadside” beginning in August. 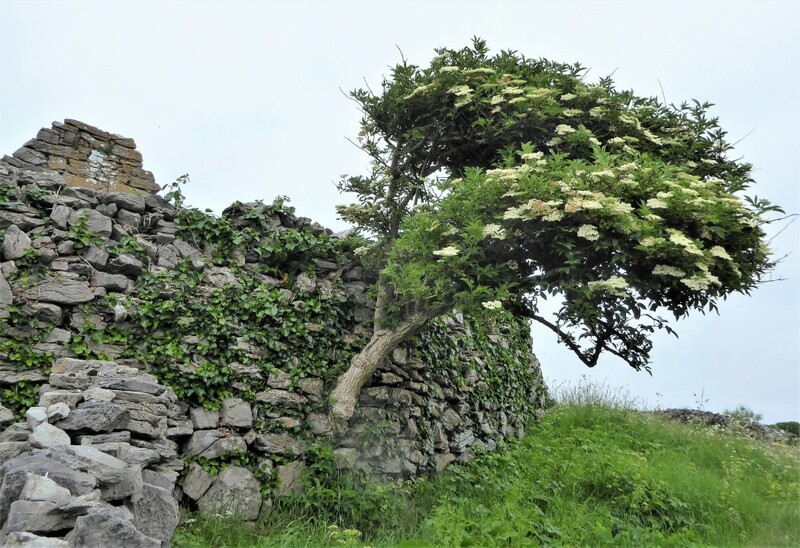 Hedgerows, including elder and hawthorn trees, are not only of great cultural and nostalgic significance for Ireland, but they are of tremendous ecological importance. We cut them down at our peril — just as the faerie have been warning us for centuries.